Large services where the A1 and the A14 cross, recently expanded. Parking is controlled by CP Plus on behalf of BP, with areas available for coaches and HGVs. The new additions to the service area. BP Express operate the filing station here and the Starbucks Drive Thru is operated by 23.5 Degrees. 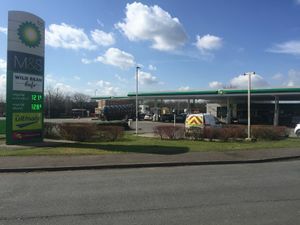 BP's signs describe the forecourt as the main part of the service station, but a new sign at the entrance (which is the first to advertise the name 'Brampton Hut services') refers to the new part. This is built on the site of the historic Brampton Hotel, at the junction of Thrapston Road and the Great North Road. Although the service area has been benefiting from an increase in traffic, it may soon suffer as the A14 is no longer going to be passing its doorstep. It will still be accessible, but via the new Brampton and Ellington junctions. The site was built with space for a number of new developments. Additional land by the entrance to the existing was developed by Brampton Valley Ltd. during late 2016 and early 2017. 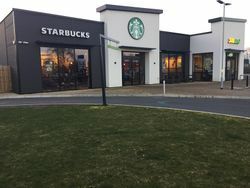 In August 2017, a Greggs, Starbucks Drive Thru and Subway all opened as part of this redevelopment. A Burger King Drive Thru later opened in 2018. A Costa is also planned to open here. Five retail units had been proposed including OK Diner and Costa as part of a number of plans put forward since 2011, but those have since been withdrawn.